Maud Ballington Booth was the embodiment of compassionate strength and courage. Together with her husband, she began Volunteers of America in 1896 and worked tirelessly to “reach and uplift all people.” Today, Volunteers of America is a premier non-profit human service organization that serves 6,000 men, women and children annually in Upstate New York. The Purse with a Purpose line in the Abigail Riggs Collection is designed in honor of inspiring and empowering women pioneers. The newest release is this Mrs. Ballington Booth purse to honor Maud’s legacy and her dedication to inspiring change for those in need. Proceeds from the Mrs. Ballington Booth purse will support Volunteers of America Upstate New York’s efforts to empower people in our community to rise out of poverty and reach their full potential. 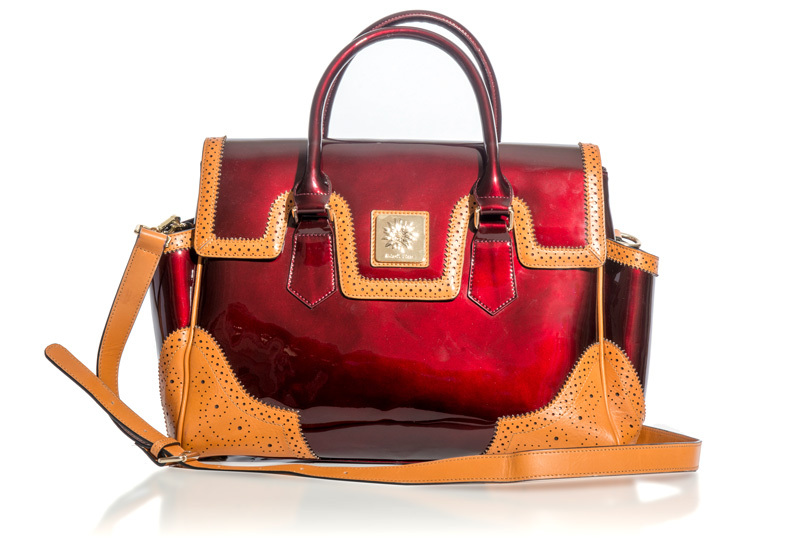 The Mrs. Ballington Booth purse is made of a burgundy patent leather with tan punch hole leather accents. It features exterior side pockets large enough to hold a water bottle and interior sewn pockets for accessories. The purse itself measures 18”x12”x6” which is large enough to accommodate a laptop computer. There is a water-lily medallion on the front purse magnetic closure, which is in reference to Maud Ballington Booth’s memorable nature analogies. A water-lily, while beautiful on the surface, had an arduous path to reach the top. What began as a bud, down in the depths of murky water, had a ray of sunshine penetrate the filth and bring that bud to the surface. All it needed was a powerful light to guide it. Maud dedicated her life to be that light for the most vulnerable and those in need. The back of the Mrs. Ballington Booth purse features a golden plate, engraved with an inspirational quote from Maud herself. “Look Up & Hope” Maud Ballington Booth Leader and co-founder of Volunteers of America (1865 - 1948). Accompanying each purse is an insert card with the life story of Maud Ballington Booth which shows her commitment to provide care for the whole person—mind, body and spirit.